After Vegas, Cash Buckhorn never thought he’d see Dr. Wren Barnes again. He certainly didn’t expect her to appear unannounced, six months pregnant with his child. This rodeo cowboy isn’t ready for an instant family. But when pregnancy complications strand Wren at Cash’s ranch, things change. Maybe it’s the magic of Christmas, but Cash suddenly wants Wren and their baby home on the Buckhorn Ranch forever! 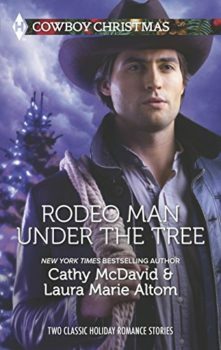 Also includes Her Cowboy’s Christmas Wish by Cathy McDavid (originally published December 2011 in Harlequin American Romance #1384).